The Vtech Toot-Toot Driver Airport features chunky, colourful pieces designed for imaginative play. Little ones will love going on travels with the electronic plane and bringing it back into land with the moving cloud platform. Non-electronic airport play set with 1 electronic plane, lift-up gate, twisting fuel pump and spinning weather vane. Includes an antenna that controls the flying cloud platform, six smart point recognition sensors that play phrases and sounds when triggered, 3 sing-along songs and 6 melodies. 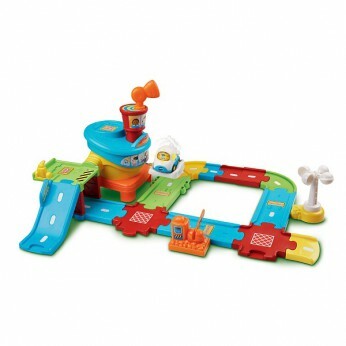 Interchangeable tracks combine in different ways and can be connected to different toot toot playsets. One supplied; Size H13.3, W45.7, D27.9cm; Batteries required: 2 x AAA (included); For ages 1 year and over; EAN: 3417761441039. WARNING(S): Only for domestic use; This toy does not provide protection. This toy costs approximately £24.99 (for the latest and best prices make sure you check our retailer list for the VTech Toot-Toot Drivers Airport above). In our review of VTech Toot-Toot Drivers Airport we classed it as being suitable for ages 1 to 3 years but recommend you check the manufacturer specific advice before purchasing.